We are a leading manufacturer and supplier of 22 Mm Wrist Watch Strap to our valuable clients. used for binding all type of long steel products like TMT bars, rods, wire bundles, angles, etc. safe tying. Reusable if required. Safe, ease of use. Available in std. packing of 2500 pcs. per box. Assisted ourselves with skillful executives, we are readily occupied towards presenting to our clients top class Leather Watch Strap. 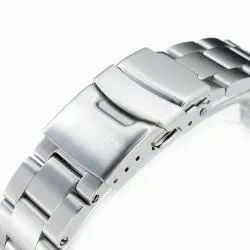 - Type: Replacement bracelet made by 3rd party manufacture, Not Original one.